The Marine Mammal Center has become a world-class marine mammal research hospital and education center due to the skill of 45 full-time staff members, the dedication of over 1,000 volunteers, and the generosity of individuals and foundations. We invite you to share in the continued advancement and success of our programs. Rescue, Rehabilitation, and Release - The Center has rescued more than 18,000 animals since 1975, accounting for more than half of all rescues of live stranded marine mammals in the United States. 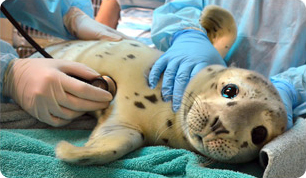 Our patients include seals, sea lions, sea otters, dolphins, porpoises, sea turtles, and whales. Diagnostic and therapeutic advances developed at the Center are applied by zoos and wildlife rehabilitation centers worldwide. Over 50% of the animals treated at the Center are released back to the wild. Scientific Discovery - Because the Center treats more marine mammals than any institution in the world, we are uniquely poised to conduct non-harmful research as we rehabilitate our patients for release back into the wild. Our clinical and research efforts work in tandem and continue to result in advancements in animal husbandry and marine biology. The Center's veterinary science staff collaborates with over 30 educational, scientific, and governmental institutions. Dr. Frances Gulland, Senior Scientist, is the president-elect of the International Association for Aquatic Animal Medicine. Environmental Education - Education is the greatest tool available to protect marine mammals and their ocean homes from future damage and to engage the next generation of global citizens. More than 100,000 visitors from around the world visit our hospital annually. Our instructors work with teachers to bring marine science education to over 35,000 students at our hospital and in classrooms every year. The Center's public education media campaign is reaching a broad audience through popular print and television ads.